Tilles Center, in partnership with the Mark Morris Dance Group’s internationally-acclaimed Dance for PD® program, will present four dance classes in 2019 for individuals with Parkinson’s. These classes are free of charge and open to anyone with limited mobility issues. Dance for PD®, founded in 2001, offers specialized dance classes that invite those with limited mobility to experience the joys and benefits of dance- while creatively addressing symptoms related to balance, cognition, motor skill, depression and physical confidence. 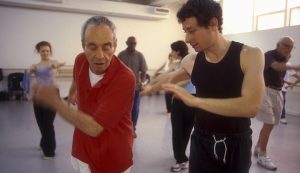 Tuesday, April 16, 11:30 am – 12:45 pm: A general Dance for Parkinson’s class, which will integrate movement from modern and theater dance, ballet, folk dance, tap, improvisation, and choreographic repertory. **Participants will receive discounted tickets for these performances. These are free events open to individuals with Parkinson’s, their families and anyone with limited mobility. Space is limited and registration is on a first-come-first served basis. All classes take place in the Goldsmith Atrium at Tilles Center at LIU Post, 720 Northern Blvd., Brookville, NY 11548. REGISTRATION FOR APRIL 16 IS NOW OPEN. To register, click here to Download the Registration Form or call Oktavia Kiss, Arts Education Coordinator, 516.299.3966 or email oktavia.kiss@liu.edu. Registration for March-May classes will take place 4-6 weeks prior to the class. Attendance at these events is free thanks to the generous support of Dance Party for Parkinson’s. Community Wellness Initiatives are supported, in part, by The Diane Goldberg Foundation and the Friedlander Family Foundation.